Packed full of delicious, healthy recipes that are quick and easy to make, A Modern Way To Eat is a totally modern take on vegetarian cooking. How we want to eat is changing. We want to eat food that is a little lighter, healthier and easier on our pockets, without having to chop mountains of veg or slave over the stove for hours. More and more people are looking to include vegetarian recipes in their life beyond a mushroom risotto or yet another red onion and goat’s cheese tart. 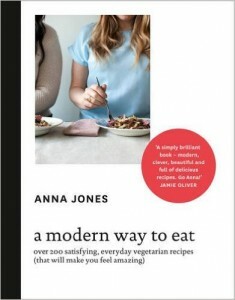 A Modern Way To Eat has over 200 recipes that are as simple to make as they are nourishing, satisfying and truly tasty.Based on how Anna likes to cook and eat every day, it covers everything from quick breakfasts to celebratory dinners, using different grains, nuts, seeds and seasonal vegetables whilst avoiding the usual vegetarian reliance on dairy, heavy carbs and stodge. I loved looking through this cookbook and seeing all the different recipes. The photos were amazing, taking up a whole page each, and were bright and clear. While all the recipes look good, the ingredient lists are long. I like my recipes to have fewer ingredients and be quicker and easier than most of these seemed. Even though this cookbook wasn’t one of my favorites, I plan on keeping it and trying some of the recipes from time to time. I think it would be a much better match for anyone who truly loves to cook and/or vegetarians. I hope you like it JoAnn! I like the idea – but I think the long ingredient lists would discourage me from trying the recipes.